Private apartment in the beautiful Belvedere Complex in Bansko, walking distance to the gondola and the town. Our apartment is in the Belvedere Holiday Club. The complex is a short walk to the gondola and the town center. 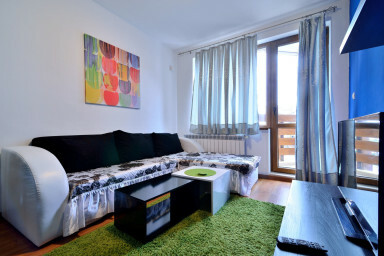 A comfortable, warm, and clean apartment in the nicest complex in Bansko. Please note that while the apartment fits 4 people, the assumption is that 2 would sleep in the bedroom and 2 in the living room on the pull-out sofa. Guests have access for a fee (payable to the hotel portion of the complex) to all of the common areas on the complex which include ski storage, a few different saunas, indoor and outdoor (for the summer) pool, fitness center, etc. We are here to help make your stay with us as comfortable and memorable as possible so just reach out to us via phone or e-mail and we'll get you what you need. We strive to make the check-in and check-out experience as seamless as possible and provide keys in lockboxes with detailed instructions on how to find them. Best way to get to Bansko would be by car. Once you reach Bansko then you won't need the car at all since the apartment is located near all attractions. We have parking on site free of charge available on first come first serve basis. Great place to relax after a long day of skiing. A comfy queen-sized bed awaits you in this bedroom. The 2nd bed is the pull out sofa with linens and blanket under it! Winter view from the apartment! View from 2 600 meters!